I converted a points layer from ArcGIS to .kmz (using ArcToolbox) and everything loads fine the first time that I start Google Earth. When I exit Google Earth I’m prompted to save my file to... I am trying to put a kmz file from my server in a google-maps-map using ArcGIS Server Google Maps API. It works fine with KML but KMZ does not show up. I am trying to put a kmz file from my server in a google-maps-map using ArcGIS Server Google Maps API. It works fine with KML but KMZ does not show up. Open ArcMap, go to the ArcToolbox > Conversion Tools > From KML > KML To Layer, configure the parameters that are displayed in the dialog box: – Input KML File: Select the layer in Kmz format (Colombia). – Output Location: Select the output path, in this case save the file to the working folder. From the Export TypeSave as type drop-down list, select Google Earth File (*.kmz). (Optional) In the File Name box, type a new name for your file. Click the Options button. 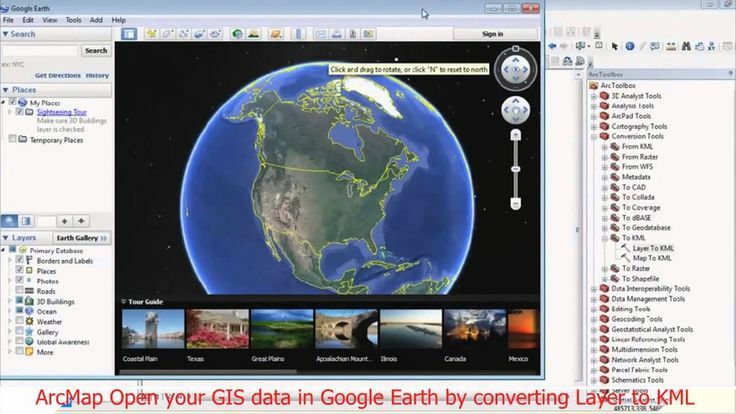 Tip: You can double-click a KML or KMZ file on your local file system to start ArcGIS Earth. To create a tile package or a scene layer package, you can use ArcMap or ArcGIS Pro.